I have had a bit of an ‘aha’ moment recently and I am not sure whether I am better off for figuring this out or just all the more scared. I have been very open here about our fertility struggle. We are currently moving into our fourth year of trying to have a baby and while I am trying to stay hopeful, there are days when I find it hard to see the light. But recently, I realized something, and it may be something that is standing in my way or at least just adding to the hardship of this journey. I want absolutely nothing more than to get pregnant again. And this past month I really thought I was. All of the signs seemed to point that way. And it was in those few days that I thought it could be happening for real this time, I realized that I am so deathly frightened of actually getting pregnant again. I was joking around with one of the girls at work and said that when we do get pregnant again, the doctors will need to put me in a medical induced coma for 9 months because I won’t be able to handle the anxiety. But as I thought a bit more of the joke I had made, I knew that this was not just a laughing matter–this was my complete truth. There was a big part of me that was so scared to get pregnant again. To be honest, I am not sure I can handle the pain of losing another baby. And it is that pain that has pushed me to build a wall, a big stone wall around me to protect myself from the one thing I want more than anything in this life. But how does any of this make sense? While it may be rational in it’s own way, all of it is quite irrational. Because in reality, even though we lost Eli and Josie and it was such pain I cannot even describe, I still would never want to know a life without them. I never got to hold them, but they still are every bit a part of who I am. And so even if I got pregnant again and the same thing happened, I would still be in crazy love with that baby as well and would still have known the happiness of the time I got to carry him or her. Now that I realize that this is my fear, I can choose to overcome it, to quiet the part of my mind that is trying to cause such nonsense, and I can start to move forward in this journey. No more of this fear holding me back. I will choose hope and not fear. Today. Right now. Ok, so now I think is the perfect time to talk about chocolate. 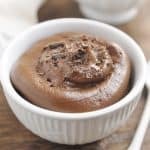 Avocado mousse is my favorite way to use up those avocados that just barely missed their peak time. And it happens quite often. I love avocado and yet sometimes it is the bane of my existence. Even when the signs say it is ready, it can still be riddled with black spots inside. 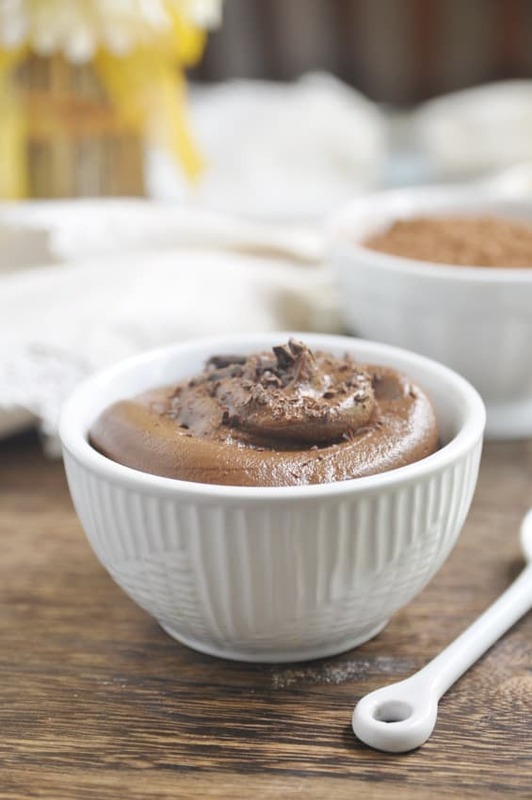 So, making the mushy stuff into a silky, rich mousse is the way to keep these from going to waste! 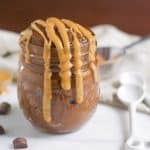 This Salted Mocha Avocado Mousse comes together in just a matter of minutes and is a decadent dessert that no one will realize is actually good for you! Process until smooth and mousse like. Transfer to bowl and chill for about 10-15 minutes or more before serving. Garnish with dark chocolate shavings if desired.